For many players in need of an economical boot option, choosing the mid-tier release in the X15 series is the way to go. 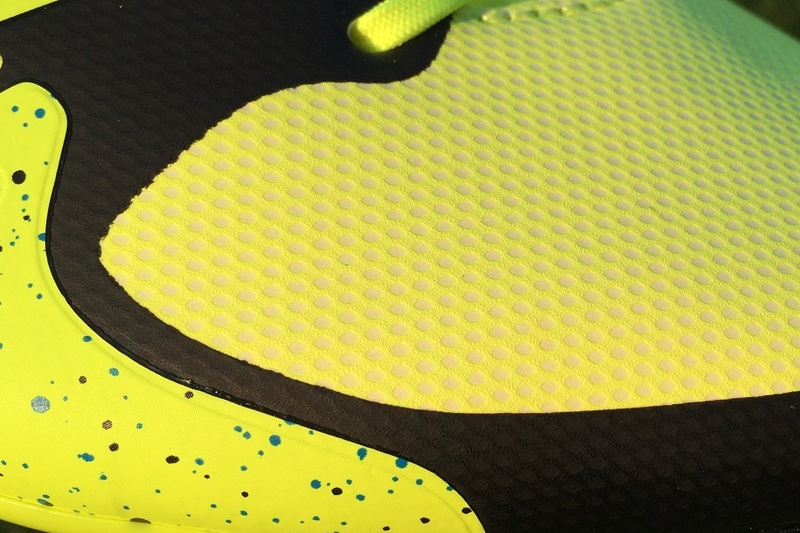 Focused on “Chaos”, the adidas X15.2 holds a very similar look to the top of the line X15.1 model, and it takes an up close look to really differentiate both. Performance wise, they’ve also received a lot of positive feedback from players who focus on the comfort and durability provided. We grabbed a pair in the original release colorway and below is a mixed “review/up close” feature to provide our summarized take on what they have on offer. There are several key areas of the boot that most want to know about, so I’ve worn this pair several times to see what level of performance is on offer. Plus, this is an ideal opportunity to detail how they compare to the highly regarded X15.1! It really is incredible how similar these boots are visually to the top tier model. For anyone with an untrained eye, they could easily pass for the premium version! Slip them on foot, and the story is eerily similar. Inside, adidas has lined the boot with a super soft material that oozes comfort. 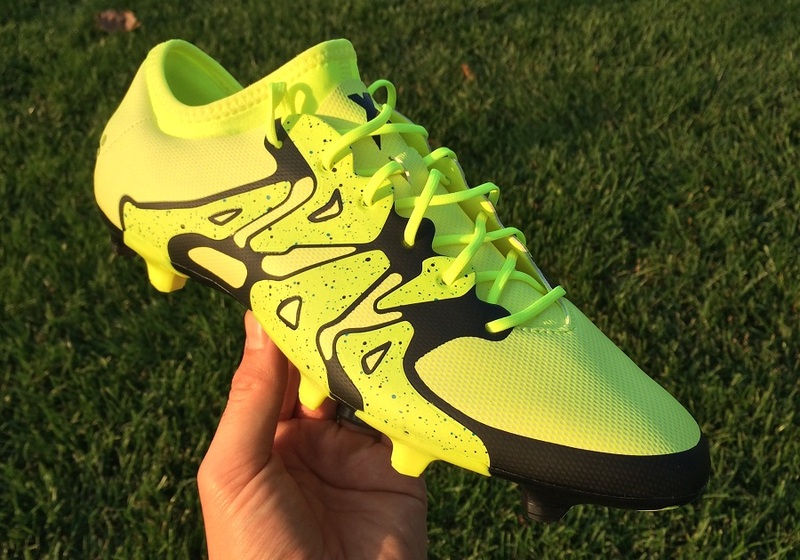 This is the type of boot that you can wear without socks and feel ready for a 90 minute game. I don’t advise wearing no socks, but it simply illustrates how positive the material inside the boot is. The TechFit collar also ensures you get that secure locked down fit, with the stretch material providing suppart right through the midfoot area. In terms of performance, the X15.2 does really well. Over the past few years, I’ve been extra critical on adidas and their mid tier line-ups. In general, from the likes of the f30 adiZero to the 11Core, each release has been relatively weak when compared to similar Nike releases. The release of the X15.2 falls right in line with the new direction adidas has taken, with a focus on revolutionizing the market. Here lies a release that features a solid mix of quality materials, much appreciated comfort and a decent price tag. X15.1 vs x15.2 – So, What is Different? The difference between the top and 2nd tier lies in the upper. 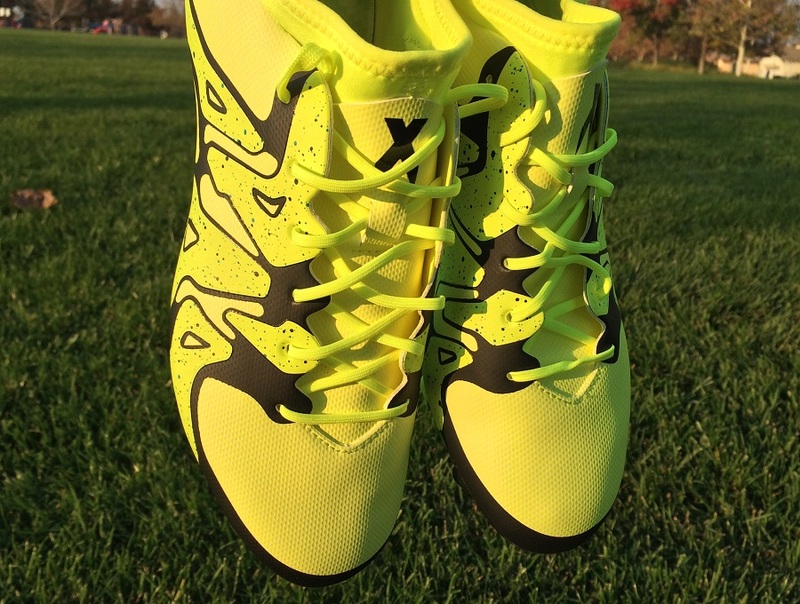 The X15.2 features an eXoskin synthetic upper that is designed with softness and fit in mind, minus the NSG treatment. 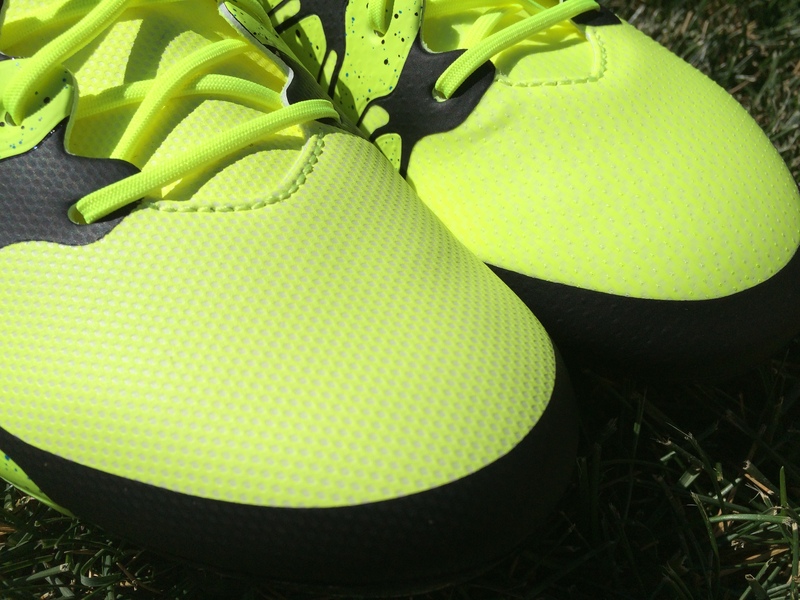 Plus, the midfoot X-cage system in less pronounced on the X15.2. The material falls more in line as a less complex one-piece, still holding a similar design that keeps them connected to the X15.1. Two elements of the boots that transfer from the X15.1 to the X15.2 are the TechFit collar and a replicated soleplate blade configuration. 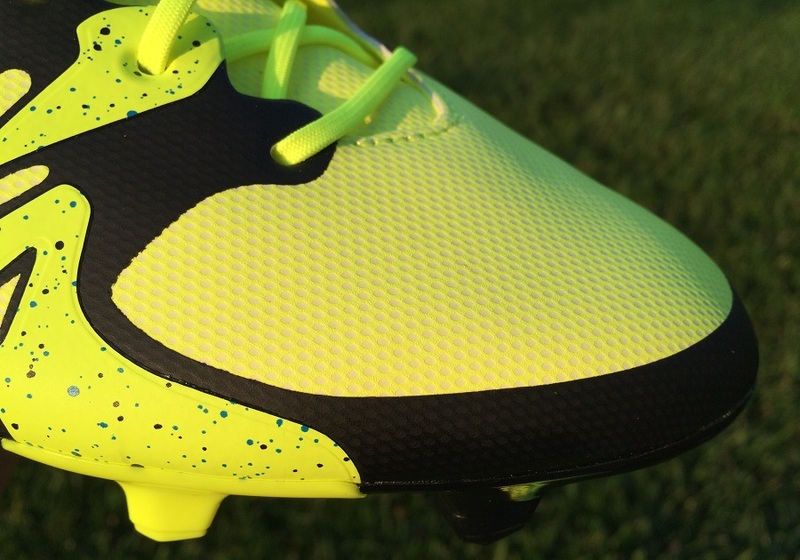 The TechFit collar provides that secure locked down fit across your midfoot. Important to note, the material has plenty of stretch to it and it is very soft, so there is no concern at all with discomfort. No matter the size of your ankle, as long as you can get your foot into the boot, it will provide a secure fit. I personally see this as a positive addition to the boot market and what adidas has on offer. How does this particular stud configuration play out on both AG and FG surfaces? Pretty well actually. 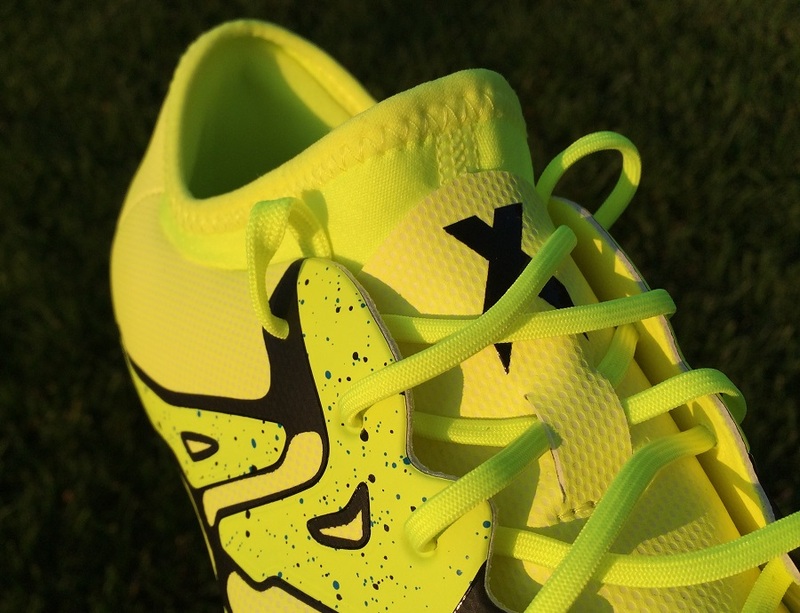 The X-CLAW base is built to give complete traction with a lightweight feel. 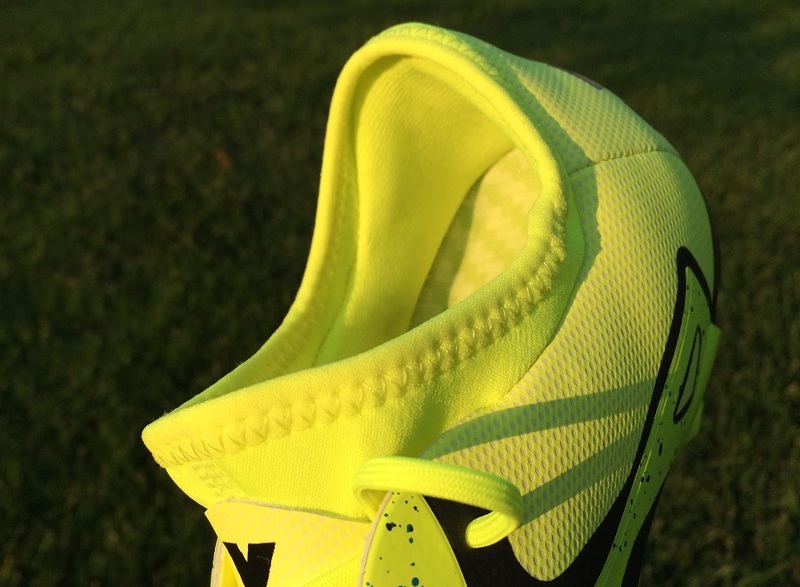 On FG, they are pitch perfect and I’m all about the smaller nubs that line the inner lining of the plate. This is a boot that is less about straight-line speed and more in tune with changing direction at speed. The addition of that inner line seems to create a more dynamic motion and connection with the surfaces. So, for example, lateral movement seems much more supported as your foot connects, grips and releases from the surface. Below, you can see how how there is some light definition across the eXoskin. To the touch, it is very soft and you really can’t describe the feel as pronounced. I’d describe it as a micro-texturing that reminds me of an extremely light sandpaper material. On the ball, you get a very natural feel with good clean touch but there is nothing about the upper that upgrades touch and control. Instead, see these as a very even toned release that will allow you to keep things simple. One positive worth noting is that the material is not super thin, so there is the bonus of decent protection across the upper. And this also has its benefits when striking shots, as the material tends to soak in some of the impact. Does the upper have a role in overall performance? I’d say yes to that. Even though there is nothing dynamic about the forefoot to the touch, the light texture provides just a little better control on the ball than a smooth material. And in wet conditions, there is a slightly tackier feel about the material that proves useful for keeping the ball in check as you dribble. This is a very true to size option length wise. 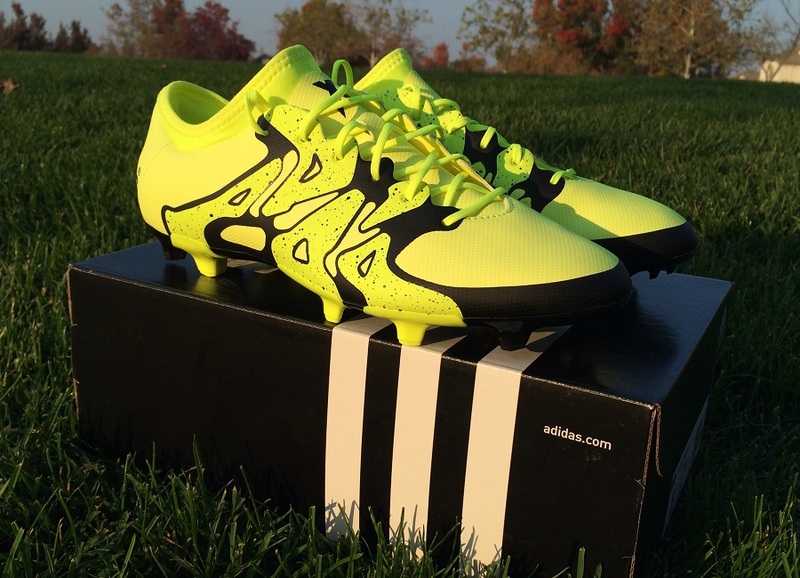 Width wise, they are a better option for medium fitting players than those that are in need of a wide fitting boot. We’ve had this discussion previously, where the Ace series has proved to be a much more accommodating option that X. Again, that plays true here with not a lot of give in the material through wear. In other words, they won’t stretch too much after first wear. I wore my pair in a 9US, which is standard, and they worked out to be comfortable through wear. However, I found the Ace15 to be more comfortable! Retail wise, these come in around the $120 range, with better prices available for older colorways. As far as adidas goes, this is probably the first time we can confirm that a mid tier release provides value for money. In all honestly, here lies one of the more popular price points for players in need of new boots. Not a lot of people can continually afford to spend $200 on new boots, so anything around that $100 is up for consideration. Why adidas hasn’t placed a larger emphasis in shoring up the quality of boots in this part of the market is an unknown. But that changes here, and we hope to see the quality of mid tier continue to develop. I say buy these with confidence! The pair imaged here is the original release colorway. Since release, several other colorways have hit the market and they are the ones you will be choosing between should you decide to secure a pair. Just to note here on a personal note; I’m not sold on the visual appearance of the X series! Each player will have their own personal opinion on the design element, mine would be negative, but performance wise they are a real winner. Head over and find the entire current line-up available at soccer.com. Highlight: The mid tier version of adidas X15 series, designed to mimic the top tier model using more economical materials. Category: Fall into the economical Control category. Would I Buy Them: I firmly believe adidas has done a fine job with these boots, so if I was considering a mid tier boot, they would be a top option. Player Position: Because of the economical nature of the boots construction, they have universal appeal for players. In other words, you are likely to get the most out of these no matter what position you play. Upper of the X15.1 (right) and X15.2 (left) side-by-side. Where is the Ace 15.2 review? It is in reality a great and helpful piece of info. I am glad that yyou shared this useful information with us. Please stay us informed like this. Thank you for sharing.